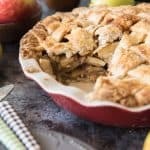 Salted Caramel Apple Pie is a scrumptious twist on a classic dessert with a buttery, flaky crust, sweet & salty caramel sauce, and cinnamon spiced apples. Perfect for Fall and using up all the amazing apples from u-pick apple orchards! Prepare the pie crust and set it in the refrigerator to chill. Meanwhile, make the salted caramel sauce and set aside 1/2 cup of the sauce for the pie and the remaining sauce can go in a jar for topping the pie just before serving. To prepare the pie, peel and slice the apples into thin (about 1/4-inch) slices and toss in a large bowl with the lemon zest and lemon juice. Add the flour, cloves, nutmeg, cinnamon and sugar and toss well to coat the apple slices. Roll out the bottom crust and use it to line a pie pan, then fill with the apple filling. This makes a very full pie and you will need to mound the apples high toward the center. They will bake down a bit as they cook, so don't worry too much about the height. Drizzle 1/2 cup of the salted caramel sauce over the top of the apples and then roll out and top with the remaining pie crust. I love the look of a lattice crust on a salted caramel apple pie, but you could use a solid crust with slits cut in the top if you prefer. Make an egg wash with the egg and a splash of water by using a fork to quickly beat the egg. Brush the egg wash over the top crust, then sprinkle with coarse sugar, if desired. Bake in a preheated 400 degree oven for 20 minutes. Without opening the oven door, turn the temperature down to 375 degrees and continue to bake for another 40-50 minutes, or until the crust is golden brown and the filling is bubbling inside. If the top crust starts getting too dark, cover the edges with aluminum foil or edge protectors if you have them. Let the pie cool for 4 hours before serving so that the filling has time to set up. To serve, drizzle each slice of pie with remaining salted caramel sauce. And I always like to eat my pie a la mode with vanilla ice cream. My favorite pie crust recipe can be found in this post about making a perfect pie crust. And use this homemade salted caramel sauce recipe, which turns out perfectly and is so easy! Pie recipe lightly adapted from Sally's Baking Addiction.